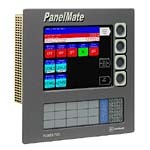 December 31, 2011 marked the end of shipments for the PanelMate Power Pro Family. This was due to a lack of availability of some critical parts. Eaton is continuing repairs and some parts are still available. PanelMate Operator Interface Equipment and we can provide new Eaton Operater Interface systems that are drop in replacements! The PanelMate® Power Pro family of operator interface products provides no-compromise functionality and performance. The PanelMate Power Pro product offerings provide many different configuration options. PanelMate Client/Server - PanelMate Power Pro Runtime software running in conjunction with Microsoft Windows 2000 Server enabling users to run multi-client sessions of PanelMate Runtime on target OI devices.